In Peter Farrelly’s Green Book, a polished African American musician hires a brave white chauffeur for an eventful road trip along the hostile, segregated Deep South in 1962. Based on a true story, the film delineates the unlikely friendship between the men, depicted through episodes widely discussed in the media concerning their historical accuracy. The stubborn, quarreling, and teasing Frank Vallelonga (Viggo Mortensen), better known as Tony Lip, is proud of his Italian roots and proclaims himself a bullshitter. He lived in the Bronx all his life, working at nightclubs and gaining the reputation of a tough guy. Suddenly, Tony becomes temporarily available to do something else when the nightclub that employs him closes for repairs. An eight-week driver job comes up, but a small detail can be relevant in the choice. The employer is Doc Shirley (Mahershala Ali) an erudite, alcoholic black pianist who wants to extend the driver position to bodyguard plus personal assistant. Of course, this is nothing that could intimidate Tony, despite some previous demonstrations of prejudice for black folks. The shock of personalities and cultures make the movie. Mortensen and Ali boasting their extraordinary acting skills while following the predictable yet extremely entertaining script devised by Farrelly, Brian Currie, and Tony’s son, Nick Vallelonga. Beyond doubt, Tony is bigmouthed, insolent, and hot-tempered, but it's also true that he has a big heart. In turn, Shirley is a sad person with identity problems; if on one hand, he has too much knowledge and money to be accepted by his fellow black Americans, then, on the other, his artistic qualities never earned him enough respect from the vile white men. He is also gay, which doesn't help him at all in a highly biased society. 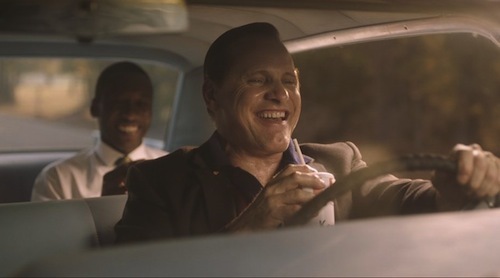 Green Book is impregnated with funny moments, conveying assertive energy that occasionally resembles the classics. Regardless of the possible nonconformity with the facts, the film was put together in a way that is visually and narratively exciting, with Farrelly abdicating of sentimental moments and sugarcoated humor in favor of a more down-to-earth approach. He was able to surprise me with this one, which overcomes the shallowness of his dry-as-dust previous films.